We believe people with something to say should have the opportunity to express themselves, and the responsibility to deliver their message with kindness and respect. Practicing civility is how you get good, and how a community gets great. At the center of this initiative are Nine Tools of Civility and one wish: for the “peace” in “Speak your Peace” to be taken to heart. Speak Your Peace is a civility project of Incourage. 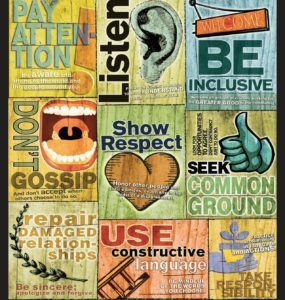 It is a resident-led campaign to improve communication by reminding ourselves of the basic principles of respect. It’s not a campaign to end disagreements. Speak Your Peace was originally founded in 2003 by Duluth-Superior Area Community Foundation. In 2008 Incourage adopted the campaign, which is based on the work of P.M. Forni, author of Choosing Civility. Since that time, local businesses, organizations, municipalities, schools, and individuals have pledged to use the Nine Tools of Civility. Area technical college – presentations have been given to cosmetology students, supervisory groups, correctional officers, operating room technicians, and IT groups. Municipalities – civility tools practiced by several local cities, towns, and villages. Schools/School Boards – campaign has been incorporated by students, teachers, staff, and administrators. Churches – Speak Your Peace themed message series offered during service. Programs – Why & How to Run for Elected Office; Speak Your Peace is a civility platform for individuals interested in running for office. Speak Your Peace is incorporated into annual leadership programs for local teens and adults.